It was only a few months ago that we tried the 48yo blended Scotch whisky from The Last Drop Distillers and found it to be one of the best blends we'd tasted in a long time. 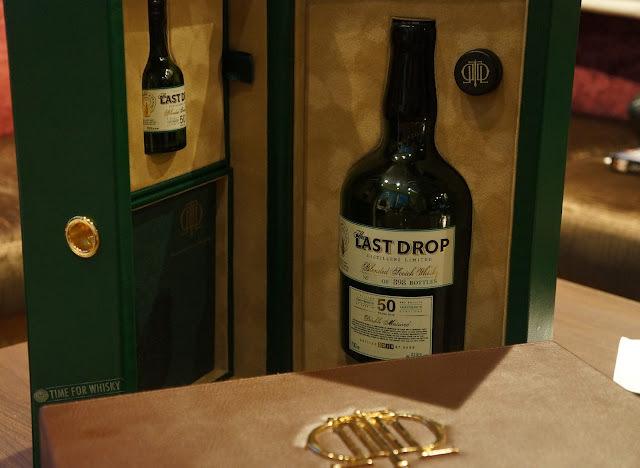 Fast forward to January and, as promised, we've now tried the next blended whisky release from The Last Drop - a 50 year old "Double Matured" blended Scotch, released this month in Hong Kong. As we mentioned back in January, this whisky is particularly interesting as it was initially released as a 30yo blended whisky (in Taiwan in the mid 1990s), then re-racked into a sherry hogshead for a further 20 years, matured in the Scottish lowlands. 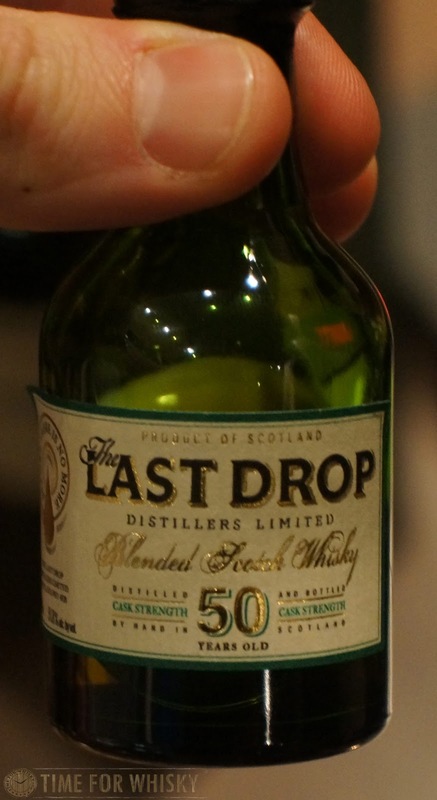 After all those years, it's still managed to retain a strength of 51.8% ABV. 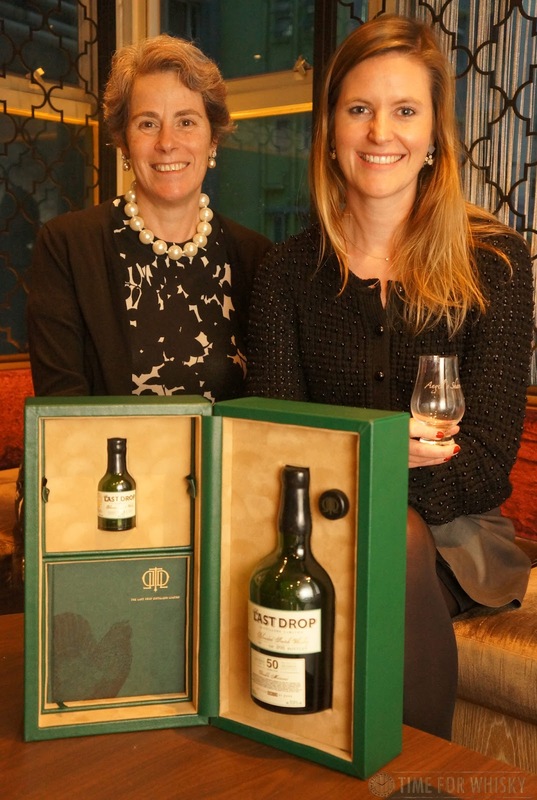 To introduce us to the whisky, and explain a little bit more about The Last Drop philosophy, Beanie Espey and Rebecca Jago (daughters of founders James Espey and Tom Jago) held an intimate tasting at Hong Kong's Angel's Share bar (which we reviewed back in 2014 here). The pair, who now have significant roles in running The Last Drop, talked us through a brief history of the company and their family's roles in the whisky and broader spirits industry. Collectively, their fathers were responsible for Johnnie Walker Blue (nee Oldest), Chivas Regal 18, the Diageo Classic Malts range, Malibu, Baileys Irish Cream (it was invented in Rebecca's family kitchen) and the Keepers of the Quaich program. Beanie and Rebecca also gave us an interesting insight into the whisky we were about to taste. It turns out those 20 additional years, which were spent in first fill Oloroso casks, weren't initially intended - the casks was, like so many, simply forgotten when the blender left the company. Whilst coy on some of the details, we were told that the blend contains 82 whiskies from all regions (including whisky from closed distilleries like Dallas Dhu), and was aged for 30 years in a Bourbon barrel before the aforementioned 20 years of "finishing" in Oloroso casks. Nose: Fresh tropical fruit initially - papaya, guava, passionfruit. Then Leather. There's oak, for sure, but it's in perfect balance. Cola, sugary coke bottle lollies, sweet confectionary. Palate: Spice. Passionfruit and pineapple. Coke bottle lollies again (hmm is there some Glenfarclas in this?). The oak is still in perfect balance, and the whisky feels like it could have many years still to go. A few drops of water amps up the sherry (adding mocha / milk chocolate notes, and some leather), and tones down the fruitier notes. There's the tiniest hint of smoke too. Finish: Long, with milk chocolate, coffee and leather. Rating (on my very non-scientific scale): 95/100. Just incredible. I love a well-aged ex-Bourbon whisky, for the big tropical fruit notes, and I love a well-aged, heavily sherried whisky for the "Christmas cake" notes. This has both. In spades. A stunning achievement and yet still such a vibrant whisky. It's only February but I suspect this will be one of the highlight tastings of the year for us. 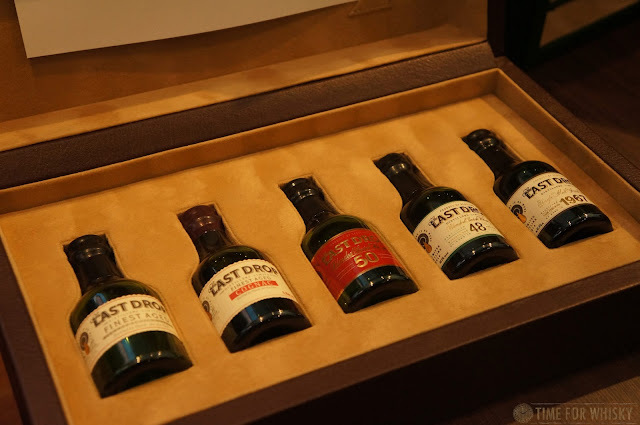 Approximately 40-50 bottles of the 50 year old "Double Matured" blended Scotch will be making their way to Hong Kong, priced at $36,888HKD. Pricing outside HK isn't yet known, but Master of Malt have been known to stock previous releases (and still stock the 48 year old). Update: It's now available from Master of Malt for £3,000. TimeforWhisky would like to thank Beanie, Rebecca, The Last Drop Distillers and Quintessentially & Co for inviting us to taste this amazing whisky.